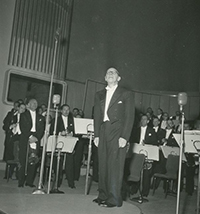 The Music Archive of the Rai National Symphony Orchestra, housed in Rai Auditorium “Arturo Toscanini” in Turin, holds a noteworthy wealth of music and music-related documents. The most precious section is no doubt the one of manuscripts and rare material: 152 documents, including letters, music scores, engravings, daguerreotypes, which make up a corpus of very relevant sources from the historical-philological standpoint. Amongst them there are also six letters by Giuseppe Verdi, the last letter Johann Sebastian Bach wrote in 1749, a letter by Richard Wagner, the autograph manuscript of Franz Liszt's Fünf ungarische Volkslieder, the autograph music score of Conchita by Riccardo Zandonai, two unknown adaptations by Ottorino Respighi from Bach and Vivaldi. Arrangements for radio and television orchestras are approximately 45,000 (counting the collections relative to Orchestra B, to light orchestras and theme songs), and they help familiarise with a repertoire still today almost unknown to the scientific community, because sources are systematically untraceable. The series of folders with opera libretti, about 2000, contains many rare documents, in some cases dating back to the 18th century. Also, the «Carafa di Maddaloni» collection is of considerable musicological interest, as it includes a highly valued group of manuscript music scores taken from 18th-century opera repertoire, and especially from Paisiello's work. While the collection of programmes (circa 5000), entirely preserved only after 1947, is a useful tool to draw up a timeline of the concerts planned (namely in Turin) in the course of the 20th century. All these documents come from different Rai branch offices in Italy, following the foundation in Turin of the Rai National Symphony Orchestra. In 1994, also all the archive material on music production from the different branch offices was gathered in «A. Toscanini» Auditorium in Turin.